2019: Won USBC Masters by defeating fellow left-hander Mykel Holliman 228-196 in title match for first major and sixth career title...Finished second in PBA World Championship losing to Jason Belmonte 236-227 in title match...Won PBA Oklahoma Open by defeating Jesper Svensson 267-201 in title match for fifth career title. Was third consecutive tournament dating back to 2018 U.S. Open he Butturff was top qualifier joining Earl Anthony, Johnny Petraglia and Walter Ray Williams Jr. as only player to be top qualifier for finals in three consecutive tournaments...Finished second in season opening Hall of Fame Classic losing to Bill O'Neill in title match 199-194. Career: In 2018 Finished second in U.S. Open losing to Dom Barrett 207-206 in title match. Was second one-pin title match loss of the season. Won Xtra Frame Kenn-Feld Group Classic for fourth career title by beating Tom Daugherty 217-182 in title match. Finished second in Lubbock Sports Open losing to Chris Barnes 207-206 in title match. Won Go Bowling! 60th Anniversary Classic by defeating Marshall Kent 244-154 in title match for third career title. Finished second in 2017 U.S. Open losing to Rhino Page in title match 256-222. As top qualifier for stepladder finals he led Page, the No. 2 qualifier, by 617 pins. Finished third in Xtra Frame Lubbock Sports Open...In 2016 won Lubbock Sports Open for first PBA Tour title defeating Shawn Maldonado 207-205 in title match. As top qualifier won South Point Las Vegas Open by beating Anthony Simonsen 277-211 in title match for second career title. Won PBA season record of nine regional titles. Had best finishes of fourth in 2015 PBA Viper Championship and fifth in Chameleon Championship...Owns 21 PBA regional titles. 2019 - USBC Masters, Las Vegas. 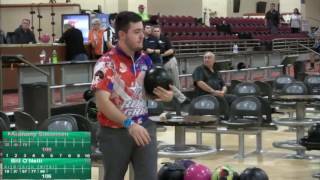 Won 2017 QubicaAMF World Cup by defeating Colombian Oscar Rodriguez 246-201 in title match...Won 2017 World Bowling Championships team gold medal...Won 2015 New Mexico Open...Finished third in 2016 USBC Open Championships all events...Won 2017 men's USA Team Trials title...Member of Team USA 2017-19...2016 West Region Player of the Year. 2016, 2017, 2018 Northwest Region Player of the Year...Silver medal in 2018 World Championships team event.